The SPEED Appliance is a miniaturized self-ligating appliance which offers overlapping benefits to both patients and clinicians. Patients enjoy the benefits of improved hygiene, aesthetics and comfort; while clinicians benefit from increased efficiency, chairtime savings and precision in tooth movement due to the action of SPEED's Super Elastic Spring Clip. The SPEED Appliance employs a Super-Elastic Nickel Titanium Spring Clip to entrap the archwire. This eliminates the need for ligature ties. 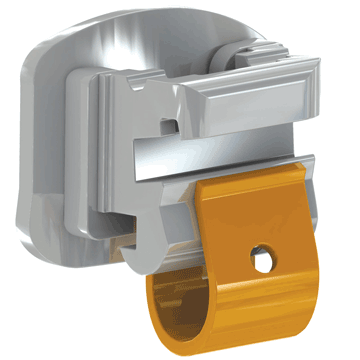 The Spring Clip snaps open to allow for archwire insertion and snaps closed to entrap the archwire. By eliminating ligature ties, the appliance reduces chairtime thus maximizing clinical efficiency. SPEED Appliance landmarks include an edgewise archwire slot available in either .018" or .022", a miniaturized SPEED "Mushroom" Hook which can be used for a variety of applications, an .016" square auxiliary slot which may house a variety of auxiliaries including preformed SPEED Hooks (for elastics), and a coloured identification mark. 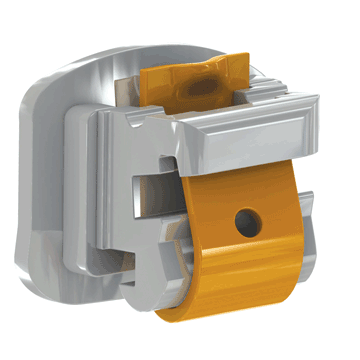 SPEED is a totally pre-adjusted edgewise appliance with built-in Torque, Tip and In-Out. Various torque prescriptions are available to suit individual preferences.